Catalan Independence Referendum Turns Violent As Police And Voters Clash : The Two-Way "Horrible scenes," NPR's Lauren Frayer reports from Barcelona. "Police dragging voters out of polling stations, some by the hair." A Spanish riot police officer swings a club against would-be voters near a school assigned to be a polling station by the Catalan government in Barcelona, Spain on Sunday. Scenes of chaos and violence unfolded in Catalonia as an independence referendum deemed illegal by Madrid devolved quickly on Sunday. As police followed orders from the central government to put a stop to the vote, they fired rubber bullets at unarmed protesters and smashed through the glass at polling places, reports The Associated Press. Three hundred and thirty-seven people were injured, some seriously, according to Catalonia's government spokesman. Spain's Interior Ministry said a dozen police officers were injured. NPR's Lauren Frayer reports from Barcelona that some people were throwing rocks down at officers from balconies. "Horrible scenes," Lauren reports. "Police dragging voters out of polling stations, some by the hair." 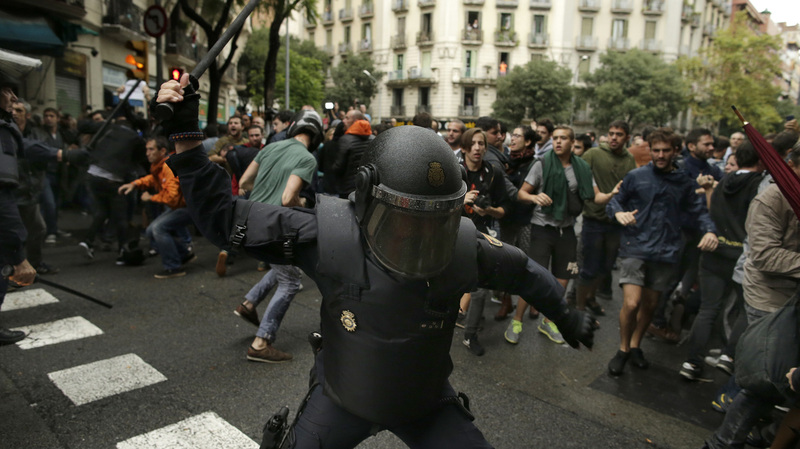 Scuffles erupted as riot police forcefully removed hundreds of would-be voters from polling places across Barcelona, the Catalan capitol, reports AP. Spanish National Police push away referendum supporters outside a polling station in Barcelona, Spain on Sunday. Nevertheless, many people managed to successfully cast their ballots across the region after waiting in lines hundreds-of-people-deep, including the elderly and families with small children, says Reuters. Sunday was a culmination of a decades-long movement in the autonomous region of Catalonia nestled in Spain's northeast corner. Pro-separatists say they deserve self-rule, pointing to their unique history, culture and language. And as a wealthy region, they say Catalans pay an outsize share of taxes to Madrid, while seeing little in return. Independence supporters knew that Sunday's vote would be much more than a simple exercise in democracy as the stage was set for a show down. "There will be no referendum on Oct. 1," government spokesman Inigo Mendez de Vigo declared on Friday. 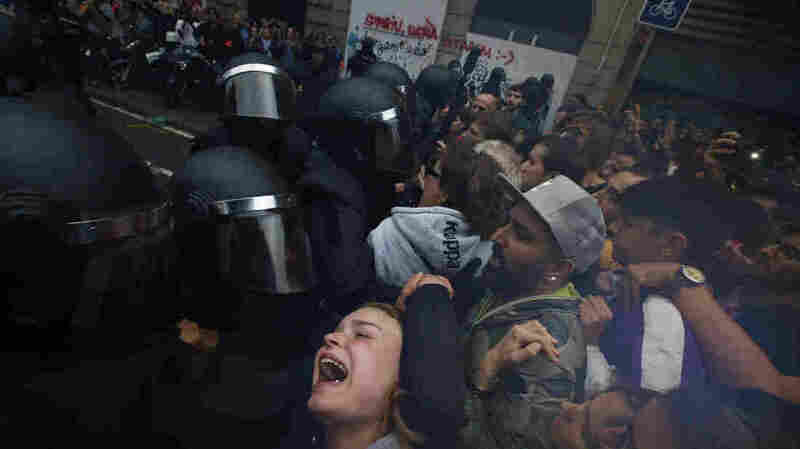 After the highest court in Spain had ruled the referendum unconstitutional, the central government sent in thousands of police reinforcements to try to halt it, in part by dismantling needed infrastructure, reports Reuters. The government said organizers were facing criminal charges and arrest. And Catalonia's High Court ruled that Google had to delete a smartphone app that the Catalan government was using to spread information about the vote, reports the wire service. Google apparently complied. Despite the setbacks, pro-separatists forged ahead. "Everything is prepared at the more than 2,000 voting points so they have ballot boxes and voting slips, and have everything people need to express their opinion," Catalan President Carles Puigdemont told the wire service. Puigdemont cast his vote Sunday in the province of Girona. Lauren reports that referendum organizers had to deploy creative tactics to skirt authorities. "The polling station where I am right now, ballot boxes had to be smuggled into the building before dawn in garbage bags so that they weren't confiscated by police." Tens of thousands of people registered to spend the night at polling places in defiance of court orders that they be shut down. Organizers told Reuters that even if people were prevented from voting, the mass sleepover would show solidarity in a peaceful resistance. But as authorities moved in Sunday, there was an apparent divide between the Catalan regional police and national police. Lauren says when Catalan police arrived Sunday morning to confront parents and teachers camped out at a polling station at a school, "they didn't lift a finger. In fact, people here applauded them and said those police are on our side." However, when national police sent in from elsewhere in Spain arrived, the crackdown began. 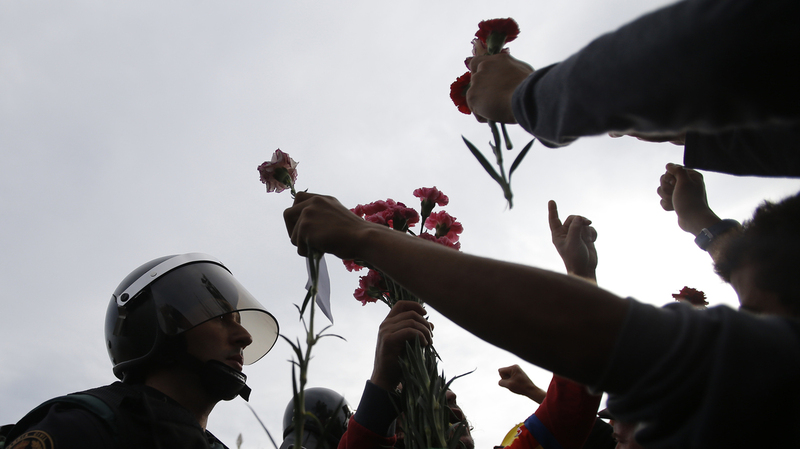 People try to offer flowers to a civil guard at the entrance of a sports center used as a polling station near Girona, Spain on Sunday. The vote is largely symbolic, its results having no legal status after being blocked by Spain's constitutional court. But experts say a constitutional crisis may be looming as the rift between Madrid and Catalonia deepens. "Although the Catalan referendum is considered unconstitutional, the defensive posture adopted by Madrid is only adding more fuel to the fire," Stephen Gallo, European Head of FX Strategy at BMO Financial Group tells CNBC. "Regardless of turnout or the result this weekend, the Catalan referendum is becoming yet another PR disaster for the political establishment in Spain." In 2014, Catalonia voted overwhelmingly to break away from Spain in another referendum that the central government had deemed illegal. Madrid did not recognize the results. Whatever the outcome of Sunday's vote, some pro-separatists sounded resigned to what could be lengthy battle ahead. "Now we are in front of guns. We are surrounded, it's true," said polling volunteer Lluis Rotger on Sunday. "But I think in the end, we will win. How? I don't know."